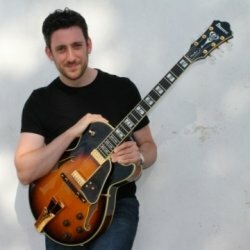 James is a highly respected and professional guitar tutor with over 12 years teaching experience as well as currently having over 50 students under his wing, teaching private lessons to both adults and children (ages 8+) as well as working in 3 primary/secondary schools (Hampshire/Surrey). James's qualifications include a HND in Contemporary Popular Music Practice from The Academy Of Contemporary Music (ACM) as well as Grade 5 music theory. Whilst studying at the ACM, James attended classes and guest masterclasses run by top industry musicians such as Tommy Emmanuel, Greg Koch, Larry Carlton, Jamie Humphries (We Will Rock You), Georgio Serci (Antonio Forcione), Nicolas Meier (Jeff Beck) & Stevie Vai to name a few. James continues to perform extensively at music venues, theatres and various public and private events across the UK. This includes performances with high profile party band 'Funkline', session guitarist for an up and coming country/blues artist 'Caddy Cooper', acoustic boy/girl duo 'Common Ground' as well as occasionally performing solo, more recently in support for Midge Ure (Ultravox). Lessons are tailored to suit the musical tastes and ambitions of each pupil and typically involve learning a broad mixture of songs as well as the key techniques and theory involved in playing the guitar. Please feel free to contact James to find out more about private lessons that he can provide. Currently a Guitar/Bass/Ukulele Tutor at three Schools and teach privately at student's houses, teaching over 50 students one-to-one. Over 12 years teaching experience and over 26 years playing the Guitar. Lessons are conducted in a very professional, yet laid back and friendly manner. Lessons are fun and engaging as well as providing insight into other music styles/genres. RGT (London College of Music) registered tutor. Grade exams available to those students who wish to take them. JamesFrom Andrew (5/5): James is an upstanding and affable young man who is a natural and enthusiastic teacher. Extremely patient and always offering positive reinforcement. I have never played a ukulele or any other instrument before but now even the wife has noticed a positive improvement. He gets my top recommendation. JamesFrom Anita (5/5): Jame has been teaching my daughter piano for a few weeks now and he is endlessly patient. She's very young but James has made sure every lesson is fun and he's come up with some really cool ways of helping her learn to read music and learn where the notes are. She's already able to play a simple piece and she really looks forward to her lessons. James explains everything really clearly and leaves excellent resources with us so I am able to help her in between lessons (and I don't play an instrument). I am very grateful James agreed to come and teach Rosie because he is fantastic and I appreciate all the time he puts in. JamesFrom Katherine (5/5): James has done a great job of getting my shy five year old started with the Eukelele. He keeps her interested and is always patient, encouraging and helpful with her. After two lessons she is already playing 2 simple songs! He is professional, reliable and has done a fantastic job so far. I would definitely recommend him for children or adults.